The data is in! 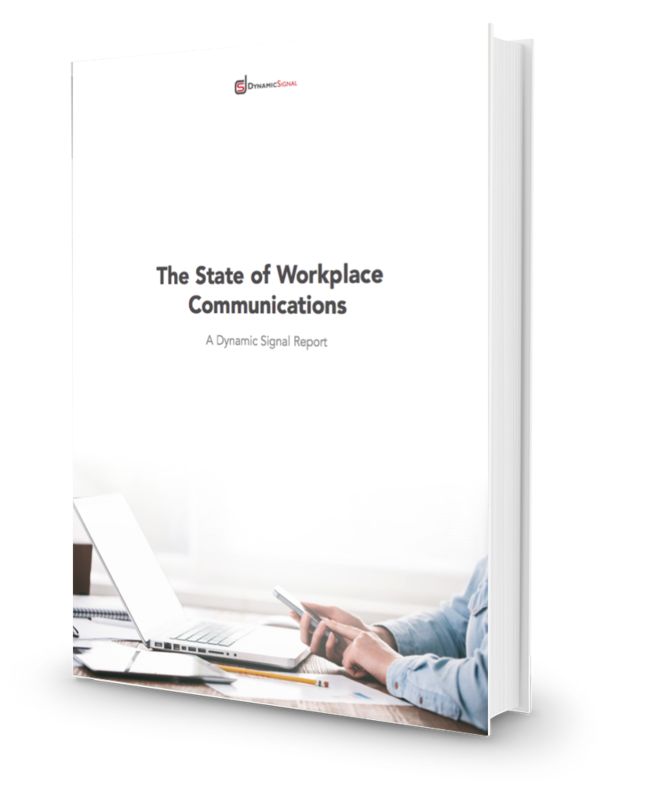 We’re thrilled to share that our first Annual “State of Workplace Communications” report is now available. We know that strong company communications are a critical concern for successful companies, but according to our research, many communication teams still struggle to reach employees in today’s disconnected, widely distributed workforce. The report gives insight into which channels are currently being used to disseminate important information, the challenges communication leaders face in communicating effectively within their organizations, and what budget is being allocated to solve these challenges. The big take away: There’s lots of work to do! 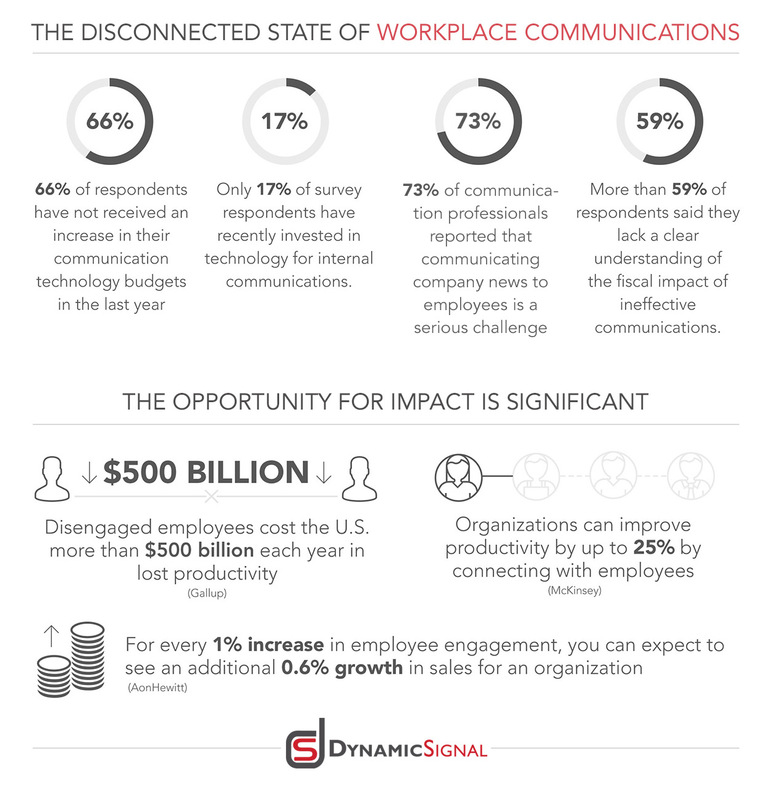 Dynamic Signal’s survey respondents said the top priority for their communications department is ensuring employees feel informed and connected, yet nearly three-fourths say they still have problems communicating with employees. And they agree! In fact, Gallup reported that 74 percent of employees are disconnected and feel that they’re missing out on company information and news. Study respondents listed email as the most effective way their organizations communicate with their teams. However more than half of the global workforce doesn’t have a corporate email address and cannot be easily reached by email. Additionally, as people are sending and receiving 122 business emails per day on average- that’s a whole lot of noise and competition! Our report also outlines the conflict between priorities and budgets. According to Gallup, disengaged employees cost the U.S. more than $500 billion each year in lost productivity. (Gah!) Organizations can improve productivity by up to 25 percent by connecting with employees, according to McKinsey and AonHewitt reports that for every one percent increase in employee engagement, brands can expect to see an additional 0.6 percent growth in sales. That’s a significant amount of potential hanging on employee engagement, yet there remains a disconnect between this need and its priority within organizations. Two-thirds of respondents to Dynamic Signal’s recent survey said they have not received an increase in their communication technology budgets over the last few years, and nearly one-fifth said the greatest challenge they face is making internal communications a priority for senior leadership. The good news is- the technology is here! Dynamic Signal is already solving this problem for over 25% of the Fortune 500- and we’re here to help you, too. The communication team holds one of the most important roles within the enterprise; they’re responsible for keeping hundreds to thousands of employees up-to-date, productive, and engaged with the company. This is no easy task- especially considering that over half the world’s workforce does not have a corporate email address. Download the full report now to learn more.